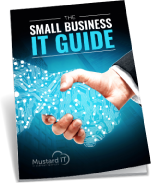 Mustard wants to ensure you get the most from your IT, and for this it is essential that your users ‘buy into’ new systems and software applications. That’s why our engineers take the time to train your staff following a major upgrade, as well as providing ad hoc support by telephone as and when it is required. Sometimes, a structured course is required where comprehensive knowledge of a new package is needed in a hurry. Mustard can get your users up to speed on Office, accounts and a range of other software with bespoke onsite or offsite courses. Please speak to one of our consultants today. The extent to which your staff maximise their use of key software applications has a huge bearing on your overall business productivity. But companies cannot always afford the time or expense of sending employees away on courses. Mustard regularly assists with hardware and software user training as part and parcel of its IT support offering. From basic Microsoft Office functions through to configuring your smartphone, we can take remote control of your devices and talk users through the procedures they need to master in order to work efficiently. Following any major upgrade, Mustard can help encourage ‘user adoption’ to ensure staff are making the most of the latest software their disposal. We can organise structured courses on specific packages but our friendly consultants also spend many hours offering ad hoc training to users over the phone, as and when the need arises.